Lilac-pink (H11) flowers, VIII–XI; straw-yellow foliage in summer, changing to coral in winter and spring; height 21–25cm; spread 46–60cm. Susceptible to damage in winter if planted in heavy ground, frost pockets or cold windy aspects. 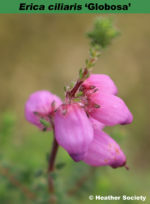 Wild-collected; found near Wareham, Dorset, England, by D. F. Maxwell and introduced by Maxwell & Beale (Broadstone, Dorset) in 1927. Named from aureus = golden yellow, after the colour of the foliage. Magenta (H14) flowers, VIII–X; grey-green foliage; broad upright habit; height 30cm; spread 40cm. Found in Brittany, France by L. Denkewitz c. 1990 but sold by H. Hatje, Tornesch, Germany in 2000. Named after the French name for Brittany. 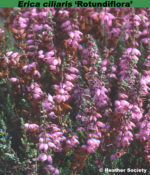 Mauve (H2) flowers, VIII–XI; mid-green foliage; height 31–45cm; spread 46–60cm. Requires annual trimming to retain a neat, tidy appearance. Possible seedling; found by F. W. Millard (Camla, East Grinstead, Sussex, England) before 1934; introduced by W. E. Th. Ingwersen (Birch Farm Nursery, East Grinstead) about 1934. Name of the finder's house, which in turn was named after a locality in County Monaghan, Ireland. Rose-pink (H7) flowers, VIII–X; mid-green foliage; height 16–20cm; spread 31–45cm. Distinctive flower colour. Found near Corfe Castle, Dorset. Bi-colour flowers, white at the base with pale beetroot (H9) tips; sepals green, marginal hairs lack glandular tips: VI-IX; grey-green; marginal hairs on foliage lack glandular tips; loose open habit; height 26–30cm; spread 31–45cm. Found north of Carnac, Brittany, by David McClintock. Lilac-pink (H11) flowers, VII–XI(–XII), in long spikes; grey-green foliage; tall, loose growth; height 90cm; spread 50cm. Found below Caldas de Mouchique, Algarve, Portugal, by John R. Tucker (Worthing, Sussex) in 1983. The Portuguese phrase means fairy of the mountain. Large, globose, lilac-pink (H11) flowers, VIII–XI; mid-green foliage; broad erect habit; height 26–30cm; spread 46–60cm. Deep mauve (H2) flowers, VIII–XI; grey-green foliage; untidy habit but develops into a bushy plant; height 31–45cm; spread 31–45cm. Somewhat tender. 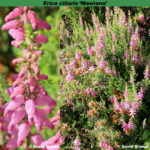 Wild-collected; found probably in Portugal by G. Maw (Broseley, Staffordshire, England) in 1872; originally described and named as a species, Erica maweana [sic]. Named after George Maw (1832-1912) - thus the correct orthography is 'Mawiana'. Rich deep red flowers, crimson (H13) flowers, VII–X; dark green foliage; height 16–20cm; spread 31–45cm. Wild-collected; found near Wareham, Dorset, England; introduced by Maxwell & Beale (Broadstone, Dorset) in 1927. Named as a tribute to a great little lady who loved her garden, and was so proud of her heather-- the late Mrs C. H. Gill of Thirsk, Yorkshire (Maxwell & Patrick 1966). Globose purple (H10) flowers, VIII–X; mid-green foliage; forms a large dome with side branches in whorls at right angles to the main stem with distinct gaps between successive whorls; height 31–45cm; spread 46–60cm. Similar to 'Globosa' but has a shorter flowering period. Wild-collected; found in Dorset, England, by D. F. Maxwell (Corfe Mullen, Dorset); introduced by Maxwell & Beale (Broadstone, Dorset) in 1929. Named from rotundus = round; florus = flower. Bi-colour flowers. 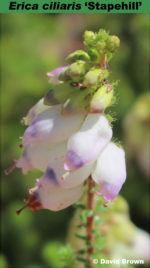 White or very pale lilac (H4) with darker tips to the corolla lavendar (H3), VIII–X; sepals have marginal hairs with prominent glandular tips; tips of flowers turn brown early; dark green foliage; marginal hairs on foliage have prominent glandular tips; height 26–30cm; spread 31–45cm. Seedling; raised by C. J. Marchant (Stapehill, Wimborne, Dorset, England); introduced by C. J. Marchant by 1954. Named after the place where it was raised. Large, pale shell-pink (H16) flowers, VIII–XI; mid-green foliage; upright habit forming a large bush; height 26–30cm; spread 46–60cm. Found on Wych Heath, Dorset.